Waking up to some sad dancing news this morning. According to the BBC, Gleb Savchneko won’t be dancing on Strictly Come Dancing this up coming season because of family commitments. Gleb also confirmed the news at twitter (more below). 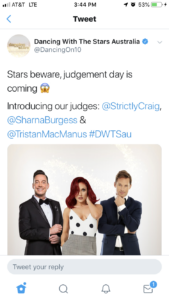 As you know from previous reports, Tristan MacManus won’t be dancing as well Aliona Vilani, Kristina Rihanoff, and Ola Jordan. Wow, lots of changes and not sure what to think? 🙁 🙁 To read on the new Strictly Come Dancing Pro line up for the 2016 Season, see the BBC. Strictly Spoiler also has written a piece on this news (thanks David!). We’re dusting off our dancing shoes to reveal our professional dancer line up for 2016 which includes three brand new dancers alongside the return of viewers’ favourites. New to the fold are world-class Latin and Ballroom dance experts – World Champion Katya Jones, Ukrainian Champion Oksana Platero and top Spanish dance professional Gorka Marquez. Returning to the Strictly dance floor are our male dancers, Anton du Beke, Brendan Cole, Kevin Clifton, Pasha Kovalev, Aljaž Škorjanec, Giovanni Pernice; and fabulous female dancers are Karen Clifton, Natalie Lowe, Joanne Clifton, Janette Manrara and Oti Mabuse. Strictly extends its thanks to Tristan MacManus and also to Aliona Vilani, Kristina Rihanoff, Ola Jordan who announced at the end of last series that they wouldn’t be returning to the show, and finally to Gleb Savchenko who has decided that due to family commitments he will not be appearing in the next series.